Floor Standing Brass Griffith Astro Telescope 64"
The Hampton Nautical Brass Griffith Astro Telescope 64" with view finder is the pinnacle of our wide telescope selection. 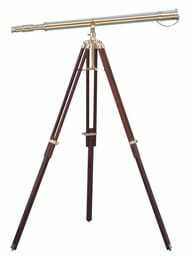 This beautiful solid brass telescope is mounted on a wooden tripod. This telescope is a beautifully functioning nautical masterpiece, with a 42mm objective lens that produces up to 15x magnification. 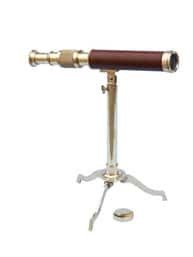 Focusing is accomplished by adjusting the eyepiece ring on the telescope tube and a removable brass cap, connected by a chain, protects the objective lens. The wooden tripod stand features smooth, polished and round legs, each with solid brass fittings and a screw release to let you adjust the height. A solid brass chain holds the three wooden legs together to maintain the telescope's position. One of the earliest known mentions of a device that may have become the marine telescope was by 13th Century by English Philosopher Roger Bacon in his treatise Opus Majus. In his writing, Bacon notes the use of “transparent bodies,” or lenses, placed in such as way so that “we may see (an) object near or at a distance.” During the next hundred years large advances in lenses, made for spectacles, lead to theories about a device that could be used for long distance sighting. A little more than 200 years after the first written account of a possible telescope, in 1589, the Italian scholar Giambattista della Porta wrote about a theoretical device that “can recognize a man several miles away,” using both concave and convex lenses. 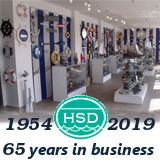 By 1608 the first true marine telescope patent was applied for in the Netherlands, although it would be the famed physicist and astronomer Galileo who created the first well known telescope. After hearing of the device, Galileo designed one of his own for a 1609 presentation to visiting Venetian senators. With the demonstration a success, and military applications recognized, the marine telescope as we know it was born. Within the next few decades brass telescopes evolved, using different lengths, lenses, and mirrors, until the Scientific Revolution allowed for industrial and mechanical advances far superior. 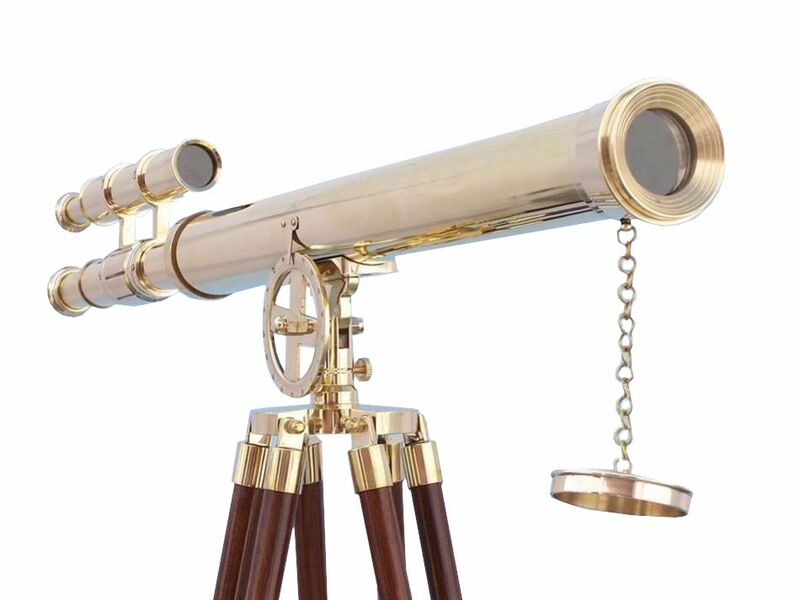 Following these advances, the antique brass telescope telescope became available to many ship’s captains throughout the vast seas, enabling greater navigation and strategic planning, and increasing the safety of sailing.